Plus One (+1) Trial Allotment 2017 HSCAP Published. Kerala Plus One (+1) Trial Allotment 2017 Result for Kerala Higher Secondary ( HSCAP ) Plus one Admission 2017 / Single Window (Ekajalakam) plus one admission trial allotment result will be published on June 12, 2017. www.hscap.gov.in is the official web site to publish plus one (+1) trial allotment 2017 result. 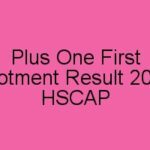 Kerala HSCAP plus one trial allotment is the list of candidates who are eligible to get allotment for HSCAP plus one allotment and admission. Kerala HSCAP trial allotment result 2017 will be published on the basis of the options of school subject combinations registered by the candidates and the marks obtained in the qualifying examination of the candidate. This trial Allotment does not guarantee that the candidate will get an allotment, but it give an idea about the chances of getting allotment based on options exercised along with the application form and the rank of the candidate. This will help the candidates to make necessary changes o the options to get a better chances for the first or future allotments. All the candidates who are submitted online application for HSCAP plus one admission through the single window system HSCAP can check plus one trial allotment result 2017 from the HSCAP web site www.hscap.kerala.gov.in. Click on the link “Trial Allotment”. Enter the Application Number and Date of Birth and submit. The trial allotment result will be displayed in the page. Kerala HSCAP allow the candidates to make changes or corrections in their options registration after the trial allotment has published. Based on this modification and corrections of options, HSCAP plus one first allotment 2017 will be published. The Plus One first Allotment Result 2017 will be declared on June, 2017 at HSCAP website. The plus one HSCAP applied candidates can check their allotment status from the HSCAP web site after publishing the plus one first allotment result 2017. The candidate who got an allotment in the Kerala plus one first allotment 2017 result can download the allotment memo and report to the school to get plus one admission.